OS X 10.9, which is internally codenamed “Cabernet,” will focus on various “power-user” enhancements and take core features from iOS, according to our sources. Unlike operating system updates such as OS X Leopard and OS X Lion, OS X 10.9 will likely not be an overhauled approach to how the operating system feels and functions. The ability to keep a different “Space” or full-screen app open on a different monitor (in multiple monitor setups) is another important power-user feature coming in 10.9. This feature was forecasted by Apple Senior Vice President of Software Engineering Craig Federighi last year. 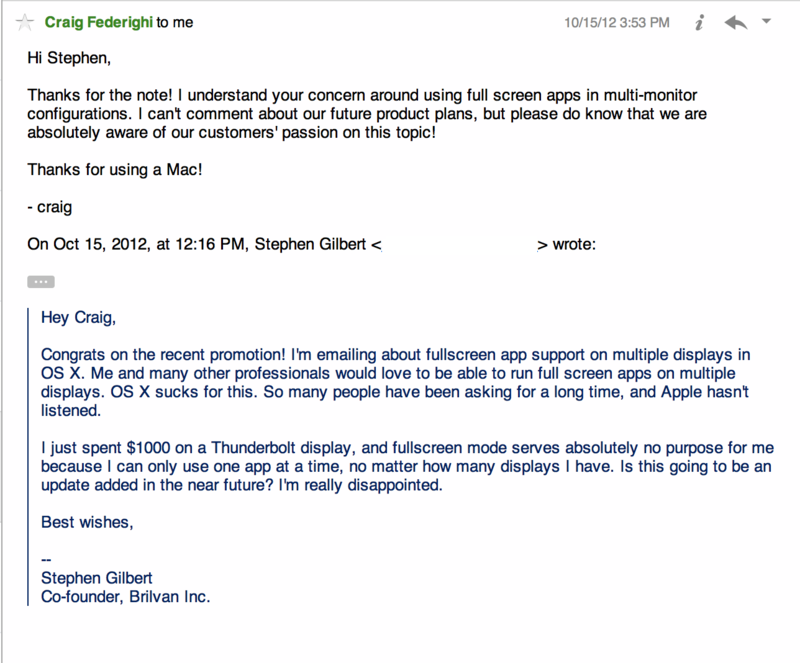 In October, reader Stephen Gilbert shared an email exchange with Mr. Federighi in which Gilbert complained about the lack of proper multi-monitor support in OS X Mountain Lion. The Apple executive said that Apple is “absolutely aware of [its] customers’ passion on this topic,” according to the email exchange. 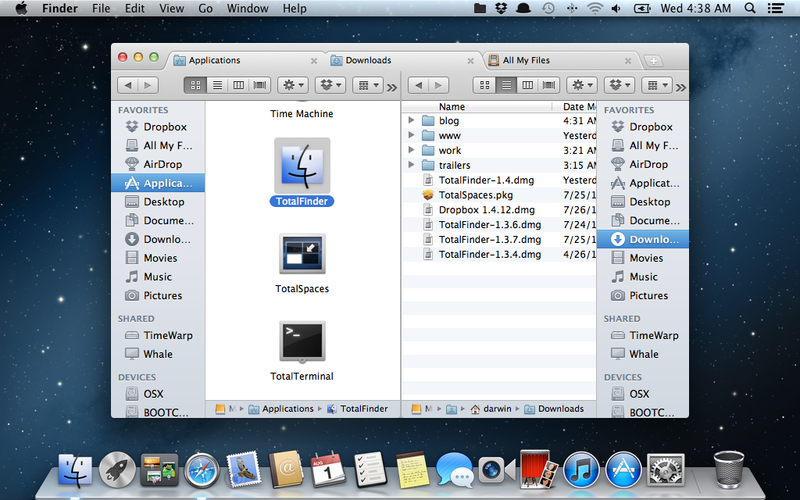 According to our sources, OS X 10.9 will see some user-interface changes, but the changes will not be a drastic ones. Last year, we reported that early builds of OS X 10.9 included Siri functionality. It is unclear if full Siri-support is still in the cards for OS X 10.9 or if the functionality will be glued to future hardware updates (for instance, iPhone 4 versus iPhone 4S). The shake-up at the top of Apple’s overall software group shifted around multiple iOS and OS X projects, so anything on the roadmap prior to this shakeup could have been altered, according to a person familiar with the situation. OS X Mountain Lion added many app-based features from iOS, such as Messages, Notes/Reminders, Game Center, and AirPlay, but the additions in OS X 10.9 from iOS will focus more on system fundamentals. According to one source, Apple has been testing a new multi-tasking system for OS X that is similar to the quick-app-switcher function on iPhones, iPads, and iPod touches. The multitasking feature will be functional for applications in the background, according to this person. Additionally, Apple could use app-pausing technologies from iOS to pause background application processes in OS X. This is significant as full performance could be given to foreground apps, which could help optimize battery life on Apple’s notebook computers. It is unclear if this feature will make the cut for 10.9’s public release. Our developers have had the most prolific and profitable year ever, and we’re excited to show them the latest advances in software technologies and developer tools to help them create innovative new apps. We can’t wait to get new versions of iOS and OS X into their hands at WWDC. Apple’s last two operating systems shipped in the summer, which suggests it is likely that 10.9 will also see a summer release. OS X 10.9 was originally scheduled to be previewed earlier this year, but Apple decided to introduce the operating system alongside iOS 7 at the upcoming Worldwide Developers Conference. Recent rumors have indicated that Apple moved resources away from OS X 10.9 development in order to focus on iOS 7. This likely contributed to Apple moving back the next OS X’s debut. As we previously noted, the operating system seems to have already been fairly widely distributed inside Apple, based on views to 9to5Mac with computers running OS X 10.9. Top image created by Charmanderfan7 on DeviantArt.